During the Disney Channel premiere of their original movie Zombies, a promo announcing Descendants 3 aired. Dove Cameron who starred in the first two entries in the series about the descendants of Disney villains, walks through the forest, and teases the appearance of her father. Cameron, Sofia Carson, Cameron Boyce, Booboo Stewart, Mitchell Hope and China Anne McClain are returning for Descendants 3, as well as executive producer, choreogrpaher and director Kenny Ortega and script writers Sara Parriott and Josann McGibbon. 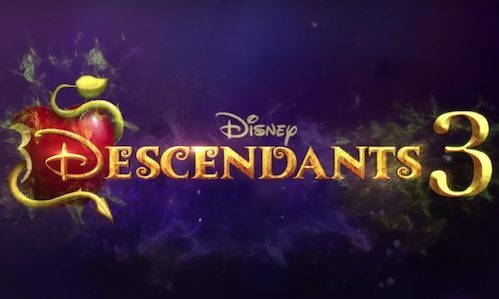 Production has begun in Vancouver and Descendants 3 will premiere in the summer of 2019. Descendants 2 stared Dove Cameron as Mal, Cameron Boyce as Carlos, Sofia Carson as Evie, Booboo Stewart as Jay and Mitchell Hope as King Ben; and ushered in new villains China Anne McClain as Uma, the daughter of Ursula; Thomas Doherty as Harry, son of Captain Hook; Dylan Playfair as Gil, son of Gaston; and Anna Cathcart as Dizzy, daughter of Cinderella’s evil stepsister Drizella and granddaughter of wicked stepmother Lady Tremaine. Also starring are Brenna D’Amico as Jane, the daughter of Fairy Godmother; Melanie Paxson as Fairy Godmother; Dianne Doan as Lonnie, the daughter of Mulan; Jedidiah Goodacre as Chad, the son of Cinderella; Zachary Gibson as Doug, the son of Dopey; Keegan Connor Tracy as Belle and Dan Payne as Beast. Emmy Award and DGA Award-winning director Kenny Ortega (Descendants, High School Musical movies) is the director, executive producer and choreographer of Descendants 2. Wendy Japhet (Descendants, An Education, The Italian Job) is also executive producer. Writers Sara Parriott and Josann McGibbon (The Starter Wife, Runaway Bride), who won a 2016 Writers Guild Award for Descendants, wrote Descendants 2 and also serve as executive producers.